With Boss's popular OS-2 OverDrive/Distortion pedal, it's like having two in-your-face effects pedals in one. That's because, with it, you can produce all kinds of overdrive sounds, tons of distortion flavors, or a massive combination of the two. The OS-2 has four built-in controls - Level, Tone, Drive, and Color - which let you summon your sound. But, whether you drive it hard, or give your tone just that perfect subtle crunch is up to you. 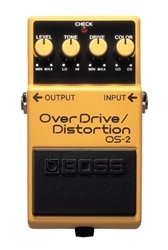 Either way, you'll love the Boss OS-2 with both single-coil and humbucking pickups.